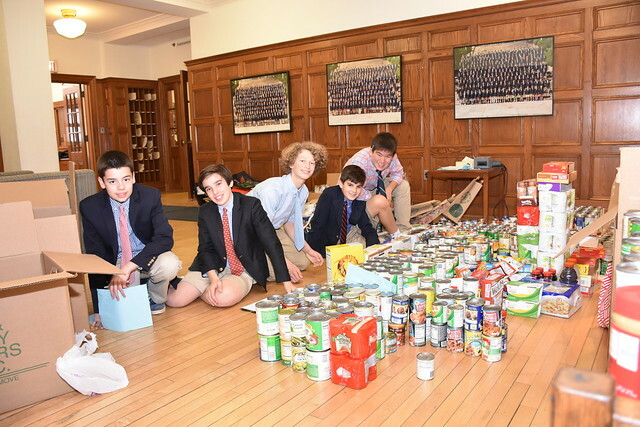 In the spirit of Thanksgiving, Lower School students brought in 1,297 canned and dried goods to donate to We Are Family, a local nonprofit that serves low-income seniors in D.C. Lower School vestry members, took charge of the canned food drive. The Upper School added dozens of gift cards to our canned goods to help those in need. We give a special thanks to the vestry members, Form II and B students, Lower School assistant Joyce Murphy, Lower School Head Fred Chandler, Tony McCane with Sodexo, and Mark Andersen from We Are Family, who all helped bag and box the cans and load the truck. Before the holiday, St. Albans students were treated to the annual Thanksgiving luncheon, complete with all the trimmings—and all made from scratch. The boys were quite hungry, eating 300 lbs. of slow-roasted whole turkey, 700 lbs. of turkey breast, 200 lbs. of mashed potatoes, 90 lbs. of stuffing, 80 lbs. of brown sugar sweet potatoes, 40 lbs. pit ham, 40 lbs. of macaroni and cheese, 30 lbs. of green beans, 1,000 dinner rolls, and 90 pumpkin pies. Chef Oscar Hernandez and the kitchen staff drove to STA on a snowy day—one that ultimately closed school—to start preparing the feast that would feed 580 boys and 130 faculty-staff members. Another Thanksgiving tradition is the annual Upper School wishbone pull between the headmaster, Jason Robinson, and the head prefect, Harrison Grigorian ’19. More than pride is at stake. If the prefect wins, the students get a free dress day. We have much to be grateful for here at St. Albans.